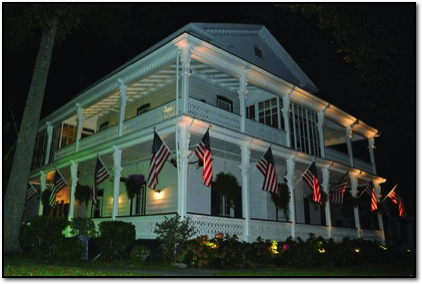 For several years along with my paranormal investigating partner Laurie Hull, the two of us have hosted "Ghost Hunter Weekends" at Elaine's Bed and Breakfast in Cape May, NJ in the fall and sometimes in the spring. Between my experiences, Laurie's experiences, and the guests experiences, there is a lot that often happens here! The first time I stayed here I woke to a small figure at the end of my bed watching me. Wanting only to sleep, I buried my head under my pillow. The next day I learned my room is a known haunting spot for two young children, a boy and a girl. The second night I was awoken three times by the old fashion nightlight in the bathroom having been switched on. By the third time I unplugged the nightlight. Of note, they no longer use these in the bathrooms! A later investigation seemed to indicate the boy child was killed in some type of car or cart accident, and it is believed both children are tied to the land and likely a previous structure that burned in the great fire of Cape May. The bar is the known area of a dark male presence. He is not evil, though he does seem to like to be left alone. One corner of the bar is often very cold, and he's known to open and close the doors in the back, which I've witnessed. The bar area was once a gentlemen's club, and it's believed he may have been some type of caretaker. While using the Echovox app on my iPad in the bar area, when asking for a name a very profane response was returned, along with a sinister laugh. In what is now the theater, which at one point was the backyard as well as possible site of an earlier home, the name Carmella was given on an EVP recording, along with backwards speech which appeared to state "That's me." This recording can be found on the Video/Recordings page.